Base of Operations: Ireland, c.1st century B.C. Powers/Abilities: His body gave of heat, capable of melting snow and ice, or turning water to steam. In battle he became possessed by a berserker rage which would warp his body out of shape into monstrous forms. It is said that only Cúchulainn could heal the wounds he inflicted on his enemies. He often used a unique harpoon like weapon with vicious barbs, known as the Gae Bulga. 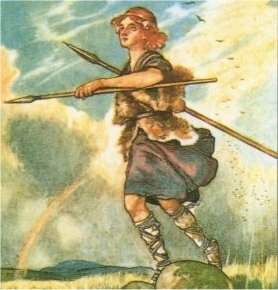 History: Setanta was born almost a year after the god Lugh kidnapped his mother on her wedding day. Lugh eventually allowed Dechtire to return to her groom with her newborn child, where her understanding fiancee still agreed to marry her and raised the child as his own. Setanta's strength and daring were exceptional, even as a child. At the age of seven he killed a fierce dog owned by the smith Culainn. In recompense he promised to find the man a new animal, and in the meantime act as a guard to Culainn's house; thus he gained his new name, Cúchulainn, "Hound of Culainn". Cúchulainn grew up to be a member of the Red Branch, a group of heroes who protected the king, his uncle Conchobar. Although described as being short, he distinguished himself battling the lake-dwelling giant known as The Terror, his way of proving he was the strongest member of the Red Branch. He was to die young, however, stabbed with a spear by his long-time enemy Lugaid, and then decapitated by same; even in death he proved dangerous, as his falling sword managed to slice of his slayer's right hand. He was buried with his wife, who died of grief upon hearing of his death.